At my work, in West Oakland, Esther's Orbit Room is the running joke around the office. The management always says that they're going to take clients out to eat at what looks from the outside like the king of all dive bars. 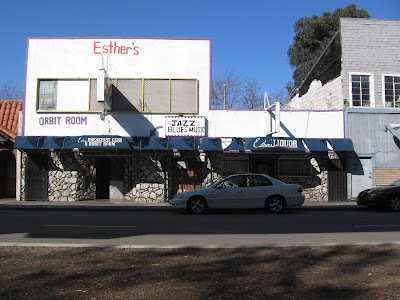 It's hard to believe that 50 years ago, Esther's played host to Aretha Franklin, BB King, Al Green, and every other black superstar of the era. It's even harder to believe that 7th Street was once the liveliest part of Oakland. 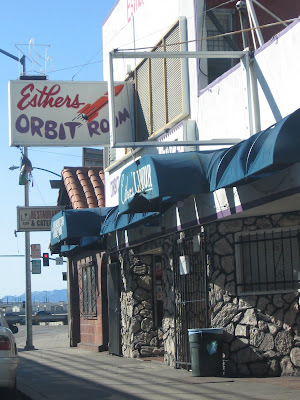 As one article puts it, "Esther's Orbit Room bar and restaurant is the only business left from the days when Seventh Street was a bustling, 24-hour, commercial hub crowded cheek by jowl with jazz and blues clubs, restaurants, stores and rooming houses that served a thriving blue-collar clientele of railroad, shipyard and military workers." The slow decline of the area began in the late '50s, when the Cypress Structure part of the freeway was completed. It was built along what is currently Mandela Parkway, and it cut the section of West Oakland off from downtown. Then in the mid-'60s, the West Oakland BART station was installed on Seventh Street. To save money, the line was built overhead -- unlike the underground lines in Berkeley and downtown Oakland -- right down the middle of Seventh. The noise created by the trains made it difficult for musical acts to play. ...But the biggest blow to the region came in 1960, when the Postal Service announced that it would demolish 12 city blocks full of residential Victorians to install a state-of-the-art postal distribution facility...The demolition occurred in 1960, but construction didn't begin until 1966 and wasn't completed until 1969. So for almost a decade, much of the neighborhood sat empty. 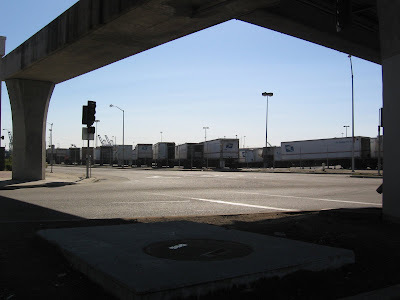 Freeways, noisy BART lines, and a Post Office megacenter--three massive government projects in one place that completely decimated everything else in their path. Seventh Street is now pretty much a no-man's land. If there's a ray of hope in this story, it's that such megaprojects were much more popular in the 50s and 60s than they are today. Agencies now have to contend with community organizations, environmental impact reports, and a half-century of damning evidence before they start tearing down houses and putting up monolithic structures. Then again, maybe I'm being too optimistic. The article ends by noting plans for another "transit village" at the West Oakland BART station. We can only hope it's as successful as Fruitvale Village, the good-in-theory Transit Village I wrote about recently. The government destroys a thriving community, then spends another grip of money trying to put the pieces back together, badly. It's enough to turn a lefty progressive type into an anti-government conservative. Saw Esther's many times. Used to work beyond the RR tracks (where Sea Land is now) at LASME on the dock, driving for Ringsby (mostly the Arizona Pacific part of Ringsby), driving for Ashland Oil (Simas Bros.), and working at the Powerine terminal as well as driving for Powerine. Here's hoping that others remember Jimmy's Shine Parlor, Geogie's Doggys, Pearson's Blue Flame (restaurant? ), and my favorite Tyson's Barbeque. Tyson's was the best BBQ I ever had and probably will ever have. Those were some good years and I'll always think of them as some of the best times of my life. It just seemed that people were there to first build and improve and then enjoy. I'd go back to those days in a minute. Thanks for the comment. What years were you working in the area? Great article. I would love to see some photos of 7th Street from its heyday. Anyone? 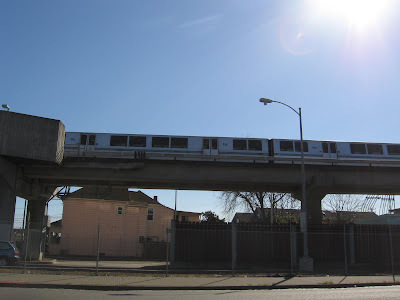 Not sure when construction began, but the West Oakland BART station didn't open until 1973 (according to Wikipedia). Drunkmeyer is right. The post office--and the razing of 6,000 homes under "urban renewal"--happened in the 60s. But BART as a system didn't open until 1972, so it would have been impossible for the noise of trains to interfere with music in the 60s. Esther's was still a happening venue well into the late '90s although no longer featuring top acts on a regular basis, still a good place to get a cold beer and hear some good music. They also had a one of the best juke boxes I've ever seen. I don't recall Tyson's BBQ but the late,great Jenkins BBQ was right across 7th from the P.O. Slim Jenkins was still alive and was quite an interesting character in local politics and business. Adding insult to injury, several abortive attempts in the past 30 years to restore or revive sections of 7th St have resulted in the total destruction from incompetence, arson and genuine criminal financial malfeasance of several large parts of what had survived. Does anyone remember the tiny, ancient movie house? Gutted by fire when workers were using a torch to remove old floor paint. Water damage from firefighting caused the building to collapse, a total ruin.